Stephen Layton and Handel’s Messiah go hand in hand in the festive season. Last week, Stephen started his Messiah season with two performances in Belfast’s Waterfront Hall in Northern Ireland. Featuring the Ulster Orchestra, the Belfast Philharmonic Choir and a constellation of stellar soloists, the concerts were yet another example of how he continues to reimagine this great work, never allowing his interpretation to stand still. His choice lineup of soloists is a fine illustration of this, with long term collaboration with Neal Davies (first performed with Stephen Layton 25 years ago) rubbing shoulders with a fresh and new collaboration (Mezzo- soprano Claudia Huckle). A review of this concert from Northern Ireland Culture can be found here. The other two soloists, Katherine Watson (soprano) and Alan Clayton (tenor), both feature along this impressive collaborative spectrum. Katherine Watson, a former member of Stephen’s student choir at Trinity College Cambridge, will appear in two further concerts with Stephen this season; Polyphony’s Messiah and Trinity College Choir’s Bach: B minor Mass, both at St John’s Smith Square with the Orchestra of the Age of Enlightenment. Watson also features on Trinity College Choir’s recording of Bach’s Christmas Oratorio. 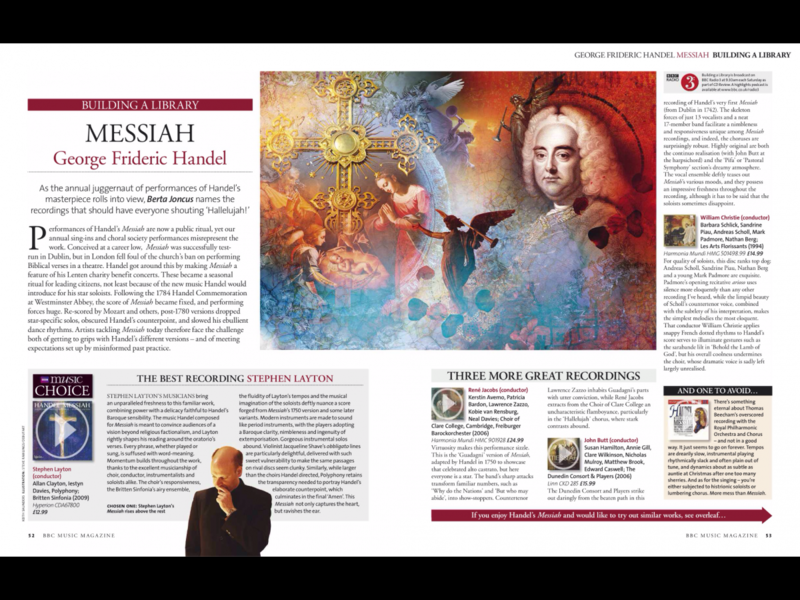 Alan Clayton appears on the Polyphony/Britten Sinfonia recording of Messiah that has been hailed as ‘definitive’ and named as ‘The Best Recording’ in BBC Music Magazine’s Building a Library last year. Clayton is a regular collaborator with Stephen Layton on his recordings, also featuring as a soloist in Lukaszewski: Via Crucis and Britten: St Nicholas. With 2014 marking 20 years since the inaugural performance of Messiah with Polyphony in St John’s Smith Square, arguably the heart of Stephen’s realisation of the work, Stephen continues to perform the work in an exciting range of venues across the UK, Australia and USA, with groups of singers ranging in size from 18 - 2,000 and orchestras ranging from 'minimalist to well-upholstered’. At the end of a year of reflection and commemoration of the start of World War I, our annual Christmas Festival celebrates themes of rebirth and creation in music which gives us all, whatever our beliefs, faith in an enduring humanity. The Festival continues to thrive in the unique atmosphere of this great venue, attracting the very finest artists, in particular those from the great British choral tradition. Choral music is now more popular than ever, with people recognising its power to move, and we invite you to share that extraordinary gift with us. This year, The Choir of King's College London present Renaissance masterpieces including Thomas Tallis' iconic Spem in Alium. Equally extraordinary, is Schoenberg's 1907 piece Friede auf Erden (Peace on Earth) which is performed by The Choir of Clare College, Cambridge. Oxford Baroque return with a festive French programme and Ex Cathedra bring a candlelit sequence of Christmas music old and new, with a special tribute to those involved in the conflict of World War I. Howard Goodall introduces Christ Church Cathedral Choir, Oxford, and an English Renaissance Feast is served up by the Tallis Scholars with music by Byrd, Turges and Tavener. This year we extend a warm welcome to three groups new to the Festival: Tenebrae Consort in a concert of carols and Christmas favourites, Spanish music specialists Ensemble Plus Ultra in a programme marking the anniversary of El Greco's death, and the National Youth Music Theatre with 'A Winter Wonderland'. The European Union Baroque Orchestra opens the festival with one of the most electrifying moments in the entire Baroque repertoire, a representation of chaos in a programme culminating in La Création du Monde, a suite from three of Rameau's operas. As we celebrate the 300th anniversary of SJSS, a glorious masterpiece of English Baroque architecture, 2014 also marks another anniversary; 20 years since the first performance of Messiah here with Polyphony, now an annual tradition. We are delighted to be working with OAE and some wonderful soloists for this and also Bach's B minor Mass with The Choir of Trinity College Cambridge." With best wishes for a peaceful Christmas and New Year. The City of London Sinfonia have launched a new Friends Scheme. "Our Friends are the backbone of our organisation and help make our artistic vision a reality. We are a registered charity and rely on grants and donations to help make our ambitious programme of events happen. Our Friends provide vital financial support to our most important activities: our concerts, recordings and our Meet the Music education programme . In return, we offer them an opportunity to get to get to know our Principal Conductors and musicians through our exclusive programme of events and benefits." Shakespeare has inspired countless musicians and artists across the centuries. Opera, ballet, jazz, rock ‘n’ roll, and musicals from Disney and Hollywood to Broadway and Bollywood have all been inspired by the Bard’s timeless tales. City of London Sinfonia are celebrating Shakespeare’s 450th anniversary with some of the most incredible music for film and theatre inspired by the plays. English songs and Korngold’s Much Ado About Nothing share the platform with Mendelssohn’s beautiful and witty A Midsummer Night’s Dream, Shostakovich’s visceral treatment of Hamlet, and Walton’s powerful and dramatic scores for Sir Laurence Oliver’s Richard III and Henry V.
For this celebration of Shakespeare, the City of London Sinfonia were joined by the Holst Singers in Southwark Cathedral, the bard’s Parish Church when he lived and worked in London. The first half featured English music for voice inspired by Shakespeare’s words from Purcell, Finzi and Vaughan Williams with a world premiere by the young composer Owain Park. Mendelssohn’s evergreen music for Shakespeare’s irreverent and popular A Midsummer Night’s Dream completes the programme, alongside extracts from the play. City of London Sinfonia, Holst Singers and Stephen Layton perform Walton’s powerful music for Sir Laurence Olivier’s Shakespeare films, the betrayal and intrigue of Richard III and the heroic battles and rousing speeches of Henry V. So integral was Walton’s music for Henry V that he wrote the music for many scene’s before filming, with Sir Laurence Olivier building the action around his score. The performance is accompanied by some of the most evocative speeches from Henry V.
The line up of soloists for Thursday's performance of Bach's St John Passion in Auckland, New Zealand have a shared history. Countertenor soloist Christopher Lowrey was a member of The Choir of Trinity College Cambridge whilst studying at the University. During this time he worked on several recordings with Stephen Layton both as a choir member and as a soloist, notably as soloist on Handel:Dettingen Te Deum with the Academy of Ancient Music. Since Cambridge, Christopher continues to sing under Stephen's baton with his professional choir Polyphony. Paul Whelan sang the role of Christ in the ENO staged production of the work directed by Deborah Warner at the The Coliseum (2000). Nicholas Mulroy features as a soloist on Polyphony's recording of the St John Passion available on Hyperion Records and has appeared with the choir in performances in London (2013, 2012, 2011) and Paris (2013). Siobhán Stagg has also worked with Stephen Layton before, singing the soprano solos in a performance with Ludovico's Band in Melbourne Recital Centre (2012). Derek Welton has also performed the St John Passion with Layton before (Vienna, 2012) and more recently they have collaborated together with the City of London Sinfonia as part of their CLoSer series: Poulenc & Paris (London, 2013). Explore photos, listen to extracts, watch videos and read more about Stephen Layton's exploration of Bach: St John Passion here. This August has so far seen Stephen Layton conduct three performances of Bach's Mass in B minor in Melbourne and Geelong. Last week culminated in a performance on Saturday 9 August in the Elisabeth Murdoch Hall, Melbourne. The concert will be broadcast on ABC Classic fm at 20:00 on Monday 11 August (11:00 GMT). Soloists included colleagues with whom Layton has often collaborated, Siobhan Stagg, Christopher Lowrey, Nicholas Mulroy and Derek Welton. The excellent MSO chorus excelled and was prepared by their British director Jonathan Grieves-Smith. Next week will see a further Bach performance with Auckland Philharmonia in New Zealand. This month's Choir and Organ features an interview with Stephen Layton where he discusses the forthcoming release of a disc of Arvo Pärt's music. Recorded with Polyphony on the Hyperion record label, the disc will be released later this year. "Stephen Layton was 'blown away' when he first heard the choral music of Arvo Pärt. The music on the latest disc he has recorded with Polyphony for Hyperion is 'calm, cathartic and gentle'"
As part of a tour to Canada this month Stephen will appear with Trinity College Choir at the Royal Canadian College of Organists' Convention in London, Ontario. The tour of eastern Canada sees the choir perform with the Elora Festival Singers (Haydn: Creation) and their own programme of Byrd, Tallis, Parsons, Bach, Howells: St Paul's Service and Parry: Songs of Farewell. Following on from his recording of "Howells - Requiem & other choral works" (Hyperion CDA67914), this week Stephen Is recording more Howells with The Choir of Trinity College Cambridge in Coventry Cathedral. The music includes the complete Collegium Regale settings composed for King's College, Cambridge including the well known Magnificat and Nunc Dimittis. Stephen Layton has just returned from Slovenia where he conducted a concert in Ljubljana with the Slovenian Philharmonic Choir. The programme featured a selection of English choral works including the first ever performance of Howells: Requiem in Ljubljana. "His Royal Highness The Prince of Wales attended a Service of Thanksgiving for the Life and Work of Sir John Tavener at Westminster Abbey on Wednesday 11th June at 12 noon. The service was conducted by the Dean of Westminster, the Very Reverend Dr John Hall, who said in his Bidding: ‘We come to worship God and to give thanks for the many gifts we have received through the life of John Tavener, for the beauty of his music, for the clarity of his vision of heaven, and for his share in the creative work of God the Creator and Father of all...'"
"...Music by Tavener was performed before and during the service. The Britten Sinfonia, conducted by Stephen Layton, performed The Hidden Face with Andrew Watts (counter-tenor) and Nicholas Daniel (oboe), and Eternity’s Sunrise with Patricia Rozario (soprano); Steven Isserlis CBE (cello) played Threnos; Patricia Rozario and Thomas Gould (violin) performed Song of the Angel; and the orchestra played Mother of God, Here I Stand..."
“Silence is like fertile soil, which, as it were, awaits our creative act, our seed"
Tom Huizenga interviews Stephen Layton for an article on his NPR classical music blog 'Deceptive Cadence'. The article explores the music of Arvo Pärt and Layton's role as a key collaborator and interpreter of his music. The Holst Singers' concert on 14 May 2014 at Temple Church has received excellent reviews from Bachtrack and Russian Art and Culture for their programme of Rachmaninov, Golovanov, Górecki, Rimsky-Korsakov, Łukaszewski, and Chesnokov. Much of the repertoire featured in this concert has been recorded by the Holst Singers on their discs of Russian music, Ikon I and Ikon II. "These almost unearthly sounds rising and falling among the high arches of Temple Church were the perfect accompaniment to one of the first summer evenings of the year..."
"The mystical setting of the “Otche Nash”, the second of this evening’s programme, was filled with indulgent harmonies and lead cleverly attacca into the famous Rachmaninov “Bogoroditse Devo” from his Vespers. I thought this was masterfully done – the unexpectedness of its appearance almost seamlessly from the previous piece leant an extra magical quality to this well known one. The ebb and flow of the words, sung with a hushed sense of awe was simply beautiful: a real highlight of the evening, despite being the most famous piece in the programme." Watch a new video of Stephen Layton discussing Handel's Israel in Egypt at the first rehearsal for the upcoming concert by The Holst Singers and The Brook Street Band. Layton will be performing this piece in St John's Smith Square on 19th June 2014. Polyphony's disc of Motets by Karl Jenkins has entered the Specialist Classical Albums Chart at No. 1 and the Classical Artist Albums Chart at No. 2. Polyphony disc named "Classic FM Album of the Week"
Polyphony's latest release of a disc of motets by Karl Jenkins has been named "Album of the Week" by Classic FM's John Suchet. The new CD, released on Deutsche Grammophon has been hailed as 'immaculately recorded' and Polyphony's 'beautiful control and tone' are particularly commended. Polyphony’s latest disc Motets by Karl Jenkins is due to be released by Deutsche Grammophon on May 5th. A celebration of Karl Jenkins' 70th Birthday, the album features new arrangements from some of Jenkins’ most popular works such as The Armed Man and Adiemus alongside new compositions. Stephen Layton has just returned from a trip to Denmark where he gave two concerts in Festsalen Ny Carlsberg Glyptotek with the Danish Radio Vocal Ensemble and Michala Petri (recorder). The performances of Uģis Prauliņš' “The Nightingale” featured Danish actress Ghita Nørby reading excerpts of the Hans Christian Andersen story that inspired the composition. Layton has recorded the piece on an album released on OUR Recordings in 2011. The recording was awarded the ECHO PRIZE (Germany) in 2012 and was nominated for a Grammy in 2013. As we enter Lent, here is a video with extracts from a concert performance of Paweł Łukaszewski’s ‘Via Crucis’. This performance was part of Wratislavia Cantans (International Festival of Oratorio and Cantata Music), performed in Katedra Polskokatolicka św. Marii Magdaleny in Wroclaw by Filharmonii Wroclawskiej Choir and Orchestra (5 September 2012). Via Crucis was recorded by Stephen Layton with his professional chamber choir Polyphony and the Britten Sinfonia on Hyperion Records and released in March 2009. Listen to extracts and read reviews of the disc here. A new CD of the choral music of Ēriks Ešenvalds with The Choir of Trinity College Cambridge is currently in production. Recorded in January in the presence of the composer at Trinity College Chapel and Ely Cathedral, the disc will be titled 'Northern Lights' and is due for release on the Hyperion Records label later in the year. Watch videos, view session photos and read more about Stephen Layton's creative collaboration with Ēriks Ešenvalds here. Stephen Layton's professional choir - Polyphony - is now on Twitter (@Polyphony_UK). New videos are now available from the 16th International Sacred Music Festival in Riga, 2013. The concert on 24 August in St Peter's Church, Riga featured music by Britten, Poulenc, Ešenvalds and Prauliņš. The encore is a setting of a traditional Latvian folk song.